View of “Sheila Hicks,” 2018. In this momentous survey of Sheila Hicks’s art that covers sixty years of production, one is immediately struck by how the seductive materiality and exuberant colors of her art manage to coalesce into an articulate and unique architectural environment. 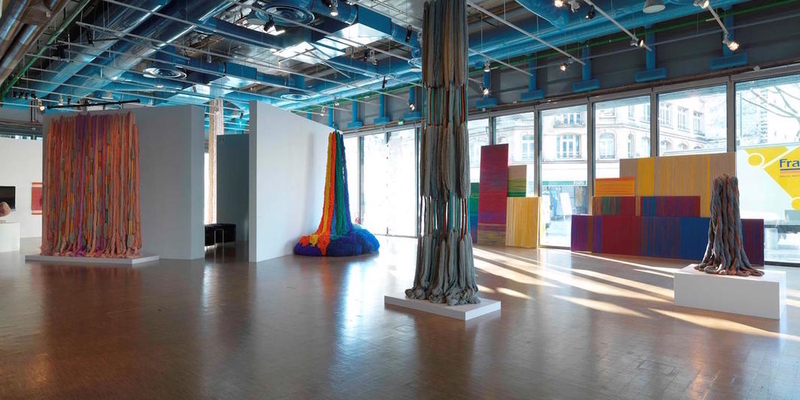 The column-like pieces where fibers cascade from the ceiling, such as Trapèze de Cristobal, 1971, and Pillar of Inquiry/Supple Column, 2013–14, add powerful structural elements that accentuate the vast, open exhibition area, creating a sense of flow between the horizontality of the room’s exposed pipes and the verticality of the sculptures. The softness of pieces such as Moroccan Prayer Rug/Nejjaï, 1972—a large and sumptuous wall-based work that slouches to the floor, made from two kinds of undyed wool in different shades of brown—contrasts sharply with the hardness of the space, transforming the Pompidou’s famously difficult gallery. Hicks also left the ground-level gallery’s floor-to-ceiling windows uncovered in order to forge a connection to the streets of Paris. The gesture calls to mind the modernist architect’s desire to blur inside and outside. Hicks is adept at erasing distinctions between image and object, process and completion. For instance, North-South-East-West, 2018, features several stretchers wrapped in a rainbow of threads. Each panel—which can be arranged in a variety of ways—partially obscures the panel behind it. The whole thing leans elegantly against the wall, functioning as both a “picture” and an “object.” The artist’s sculptural vision, honed over several decades, expands notions of space, temporality, and the “flatness” of images.